It is Autumn in Melbourne, and the weather in the past week has definitely left Summer behind - even though the forecast for the next few days will make a liar out of me! So thanks to a leaf template from Alphabet Glue, Volume Three, this week I made an Autumn tree for our pinboard - the same pinboard that was covered in this a year or so ago. And then they promptly added their own touch to it - which was exactly what I wanted! Annie at Alphabet Glue suggested using these leaf templates as bunting to showcase your child's story. I decided to use the leaves to create an ongoing story, written a leaf at a time, by anyone who felt like it. I used brown packaging paper for the tree and odd bits of scrapbook paper for the leaves. 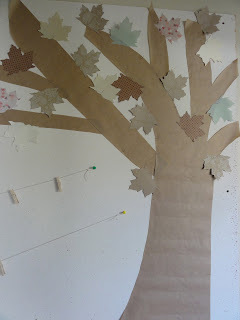 I pinned the blank leaves to the tree, and then used string and pegs to attach the 'story' leaves as they are written. Our story so far includes a tree, an alien and a paper plane - who knows where it will finish?